What is an API? What does API stand for? API stands for “Application Programming Interface.” The phrase API itself may be used in numerous contexts and have several different meanings. 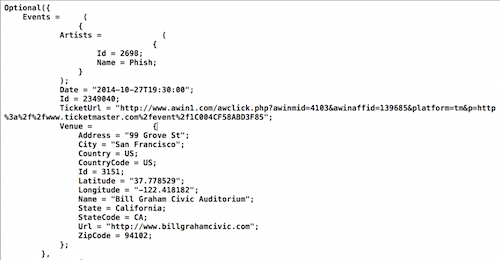 For the purposes of this article, when I say “API” I am referring specifically to REST APIs, an extremely commonly used method to retrieve data from a remote server over HTTP. REST APIs are an extremely important topic for mobile applications developers because most applications use one (or many) REST APIs to retrieve the data they need for their users. If you are new to the world of programming, I suggest taking a few minutes to read through the REST API Tutorial. Thankfully, by following this guide, you will be learning critical skills needed by most mobile applications developers in the real world. 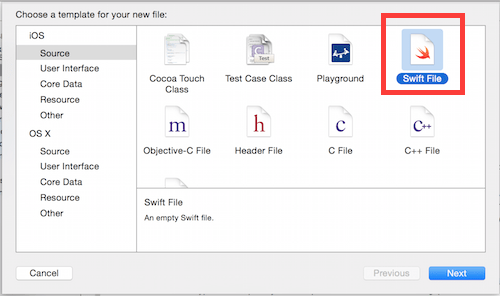 The first thing we are going to do is open Xcode 6 and create a new “Master-Detail” application. In iOS UIKit terms, what this will do is create what is called a “Universal Storyboard” which, through the magic of Interface Builder and Adaptive Layout, will allow us to create a single interface to use with both iPhone and iPad devices. Adaptive Layout is a new technology introduced by Apple to make interface-reuse less messy. In the past, multiple storyboards were often required (as well as convoluted switch statements) to perform the same goal. With Adaptive Layout, we can use new sizing and layout tools provided by Xcode to ensure that our users have the desired experience no matter what device they are using. There is more to it than that, if you are curious I’d take a look through this guide. You can name your project whatever you want, the key thing to note is that the Devices parameter is set to Universal as above. 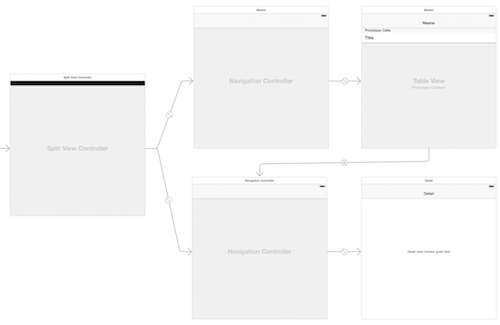 The end result of this setup will be a new XCode 6 projects with the above storyboard layout. What is going on here is that XCode has automatically created a UISplitViewController (which consists of a table with a detail view for each item in the table) for us by default. This UISplitViewController will form the basis of our application. 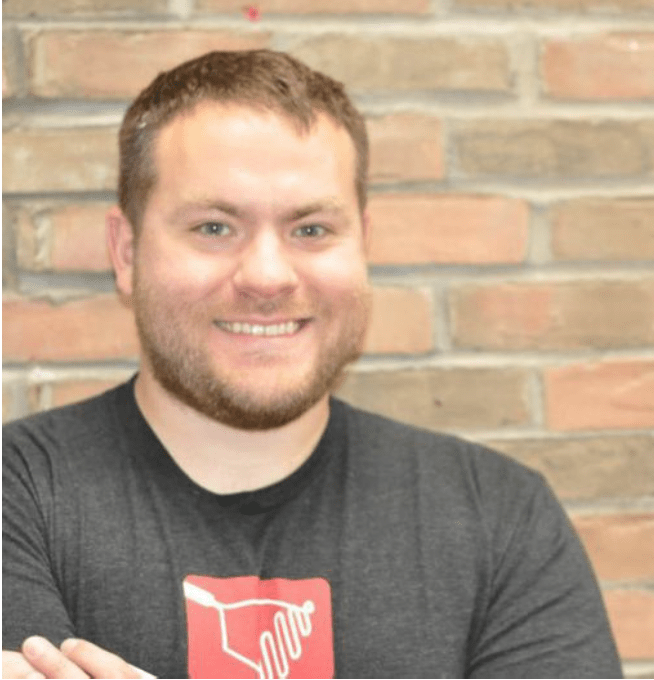 For this chapter we won’t be doing much with this layout as we will be focusing our initial efforts on making REST API calls using AlamoFire. AlamoFire is a networking library which will help make it easier for us to make calls to our JamBase API and then display the results on the screen. Following the AlamoFire installation instructions we will create a new Git Submodule and add it to our Xcode project. Follow these instructions for exact steps. 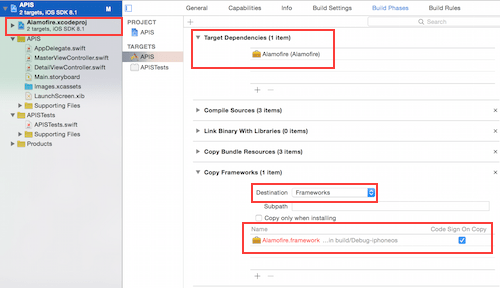 You have created a Copy Files step (renamed to Copy Frameworks in the above example) and set Destination to “Framework.” Then, add Alamofire.framework files to the copy action. Note: You will notice that AlamoFire references what is called a Git “submodule.” This effectively means that we are including a reference in our Git repo to an external Git repository managed by someone other than us. Many iOS developers prefer to use an approach known as CocoaPods for handling and managing external dependencies like this but it seems the new nature of Swift has temporarily made it easier to use Git submodules for the time being (this may change in the future). The Mashery API Network consists of nearly 50 public APIs any developer can us to make interesting mobile applications. In this guide, we will be using the JamBase API (from the Mashery API Network) to build our application and display local concerts nearby. Mashery API Network allows you to rapidly register applications with nearly 50 APIs using a single sign-on. Once you have registered as a developer with the Mashery API Network, you can use your same sign-in details to access all of the publicly available APIs. Please take a moment to create a new Mashery API account and click the link in the email you will receive to verify your account. 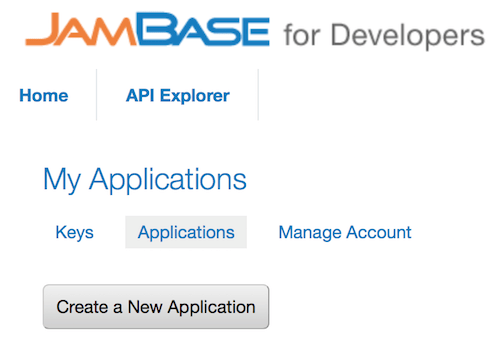 Once you are done, navigate to the JamBase developer portal and click the “Sign In” button in the upper right hand corner. Once you are signed in with your Mashery Developer account, select “My Account -> Applications -> Create A New Application” as in the above image. Fill out the provided form and submit it in order to receive your confidential developer key. Important: You will need the key you will be provided to make API calls, which we will get into next. If any of the above is confusing, feel free to get the example project from the provided GitHub repo linked at the top of this article. * This represents a collection of JamBase API Event models. Now, when we run our basic implementation, our Swift networking “engine” will render the JSON returned from the JamBase API into useful Swift “Event” model objects.